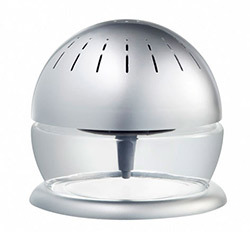 For that professional, organized, clean touch buy a Silver Snowball Air Purifier!Keep yourself and your staff healthy, creative, focused and energized when using our Silver Snowball Air Purifier along with Coffee or Fresh Lemon aroma microbe shield! Elimination of disease tarnsferral in home and office.Improvement of respiriatory functions.Lung vitality enhancement.Immunity enhancement.Is the air you breathing being dried out by heaters and air conditioners, is your home and office lacking moisture in the air? Are colds and flu’s being brought into your space? With 5 color changing lights with 3 settings on,off or choose one color (your favourite ) to benefit the color therapy and the benefits of the natural botanical extrcats from the solution that cleans each air particle.Improve your life now air purifiy with perfectaire. Perfect For Your Office, Perfect For You, Just PerfectAire Purifiers.